We have metal blinds outside: for protection at night mainly. I like daylight and usually only close them when the case calls for it. We were renovated last year and had to get curtains because they removed the metal blinds and we had nothing on the windows, so we settled for these stripes which serve their purpose very well. you can close them, open them half way or completely withdraw them from the window, which is permanently the case in the kitchen. They serve their purpose very well, as long as everyone agrees. There can be a clash of understanding of using blinds, especially if one half of the partnership grew up with blinds as part of the integrated system of life and the other half had never seen a blind before, with an old fashioned thing called curtains at home which you only closed at night to stop people looking in when the light was burning. In summer there can be complications. There is a hot relentless sun beating down on the windows throughout the day, although only on the west side. In the East the sun disappears some time after midday. As soon as the partner with the blind syndrome notices the sun is arriving drastic measures are taken. I am ready to relax on my bed after lunch: the window is open to allow for a fresh breeze and the window stripes are slightly closed, not completely. He who will not not be mentioned, is in alarm status. 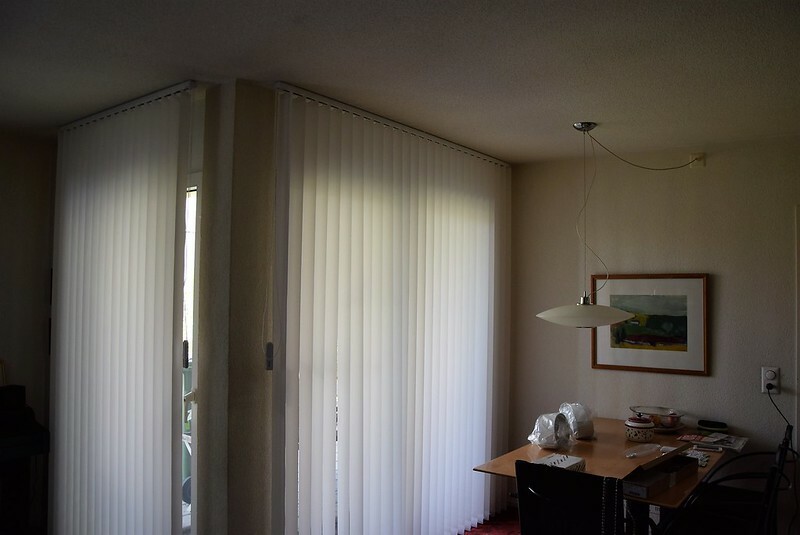 the metal blinds are lowered in all bedrooms (we have three), and the curtain stripes are closed. It goes without saying that the windows are now closed. We must conserve cool air in the living quarters, especially the bedrooms, and light and fresh air are banned. Sorry, I cannot sleep in this shrouded mausoleum, I need to breathe. And so one bedroom has raised blinds and an open window whilst the other bedrooms become vampire centers, the one where I take my midday rest. It is all a matter of putting things in a correct perspective, in a scale. I am now outside on the porch with the sunblinds slightly lowered to keep things on a cool scale. 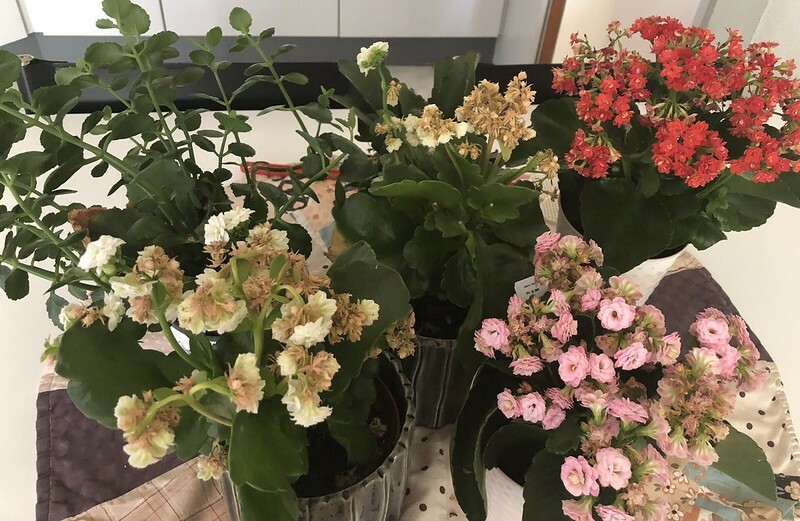 In the meanwhile I have now removed all my kalanchoe plants from the living room, where they spend half a day with no light or air, to the kitchen table. I am sure I saw them nodding their flowering heads when I replaced them. They all took a deep breathe and sighed. Yes, I am the one that grew up with curtains and open windows for fresh air, not the one that had everything closed, grew up in a dark world and every waft of air was a draught. I sense that you guys don’t use air-conditioning. We use A/C on low. Very low. But it keeps the rooms from getting damp and stuffy because here, heat isn’t the problem. It’s the humidity and no blind will solve that problem. It can be relatively cool outside, but the high humidity makes everything inside feel soggy. Very unpleasant, especially when you go to be and your bed is sort of sticky damp. An AC is not such a life necessity in Europe. Some have them, for an extra cost, but for the 2-3 weeks in a year that it would be necessary it is not worth the trouble and I can live quite happily without. Mr. Swiss got such a machine once, but give it back after a week disillusioned and a week later we asked why we bothered. My body seems to react different to everyone else in any case, so I have been told. I am quite happy in my world of windows and fresh air. Cross purposes, blinds, air flow, light, temperature control. It is a challenging negotiation in a partnership. Living in a mostly dry climate, when necessary to cool, we use an evaporative cooler, which needs open windows to work. Much prefer it to air conditioning. No air conditioning here, it is not worth it for the couple of weeks we would need it. Having MS my body reacts differently in any case. I am more comfortable in Winter than Summer, but I survive. My brother also has MS, and he does find the heat difficult. He’s happy that is work takes place in an air-conditioned office.